Coming soon: We'll be testing more electric bikes shortly. The results will be available online late April. Bottom line: The Focus Aventura Impulse is a good bike with an OK motor system. It's a capable bike for all types of riding, including cycle trails. Bottom line: The Avanti Discovery Low-E is a good bike with a good motor system. It is more suited to riding around town or commuting than on cycle trails. Bottom line: The Merida eBig Tour 300 EQ is a very good bike with a good motor system. It's great value and very capable for all types of riding, including cycle trails. Bottom line: The SmartMotion eCity is a just OK bike with an OK motor system. It is more suited to riding around town or commuting than on cycle trails. Bottom line: The Merida eSpresso Tour 600 EQ is a good bike with a good motor system. It is more suited to riding around town or commuting and not particularly suitable for cycle trails. Bottom line: The Moustache Friday 27 is a good bike with a very good motor system. It is more suited to riding around town or commuting than on cycle trails. Bottom line: The Fleetwood MTB v1.0 is a very good bike with a good motor system. It's great value and capable of all types of riding, but is most suited to cycle trails. Bottom line: The SmartMotion Pacer is an OK bike with an OK motor system. It is more suited to riding around town or commuting and not very suitable for cycle trails. Bottom line: The SmartMotion Pacer GT is a good bike with an OK motor system. It is more suited to riding around town or commuting than on cycle trails. Bottom line: The Moustache Samedi X-Road 1 is a very good bike with a good motor system. It's a very capable bike for all types of riding, including cycle trails. Bottom line: The Moustache Samedi X-Road 3 is a very good bike with a very good motor system. It's a very capable bike for all types of riding, including cycle trails. Bottom line: The Kalkhoff Tasman Classic is an OK bike with an OK motor system. It is more suited to riding around town or commuting than on cycle trails. Bottom line: The Specialized Turbo Vado 3.0 is a very good bike with a very good motor system. It is more suited to riding around town or commuting than on cycle trails. City bikes, sometimes known as “Dutch bikes”, are designed for short urban rides. They are relatively heavy – 18kg or more without the motor and battery – and often have step-through frames, swept-back handlebars, a plush seat, full mudguards and cargo racks or baskets. They might have up to 10 gears or an automatic gear system built into the rear hub. They aren’t built to go fast, cover long distances, or slog up hills. But they are comfy and can carry lots of luggage or shopping. A variation is a cargo bike, which has a longer wheelbase to accommodate additional load-carrying space either behind the seat or in front of the handlebars. 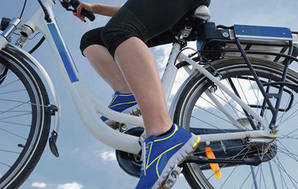 Recreational, hybrid or commuter bikes are the do-everything bike, covering a wide variety of riding from daily commuting, to weekend rides on rail trails, to longer “fitness” rides. With flat handlebars, narrower tyres, up to 30 gears and a racier riding position, they are faster and are more comfortable than city bikes, including up hills. However, they are less manoeuvrable on city streets and not so well equipped for carrying luggage or shopping, though many at least have mudguards and a cargo rack. Trail or mountain bikes, are designed for riding off-road on rough terrain. They have suspension at the front (and sometimes at the rear too), wide flat or high-rise handlebars, wide knobbly tyres and up to 30 gears. They are often repurposed as an urban or commuter bike, as they are tough, have a big range of gears, powerful brakes, and offer a balance between city-bike comfort and recreational-bike speed. Folding bikes are designed to, well, fold. That’s useful if you regularly take your bike on a train, ferry or bus, or if you need to store your bike inside your home or office. They have smaller wheels to aid folding, but otherwise ride like a recreational bike. There aren’t too many electric folding bike designs as the additional weight of a motor and battery makes them harder to carry. Will you ride short hops into the CBD, or take longer journeys? An upright bike with just a few gears or a small-wheeled bike that is highly manoeuvrable in tight spaces would suit short hops, whereas longer journeys will need something more streamlined and easy to pedal. Will your regular rides be mostly flat or rather hilly? If it’s hilly, you need a bike that’s efficient to pedal up and stable to ride back down, with good disc brakes. Will you use it on off-road trails? Your bike will need balanced handling, decent suspension, and wide tyres with good tread. A mountain-style bike would be a good choice. Do you need to carry work bags, groceries or even children? You’ll need a good rear rack at least. If you plan to carry big loads or kids, you might need to look at a cargo bike. A low or step-through frame makes a loaded bike easier to climb on and off – that may be an essential feature for you. The style of bike you prefer is a personal decision. All our testers thought, regardless of style, a bike with a balanced riding position (not too racy, not too upright) was ideal. Those bikes did everything well – they are as comfortable riding to the dairy as they are commuting longer distances or tackling a weekend adventure. If you choose a more upright, city-style bike, look for one that is comfortable to pedal without power, has confident slow-speed steering, and is stable at 25km/h (with power-assist you will be riding this fast). We recommend a mid drive e-bike. Driving through the gears makes the most of its power and torque – meaning more assistance climbing hills and at high speed. They mount low and central so mid drive e-bikes have even weight distribution. The only reason we think you should choose a rear hub drive is cost (they are cheaper, although the price gap is narrowing). However, we found mid drive motors noisier than hub drives, making an obvious “whirr” and causing a “clunk” on downshifts. The extra load they put through the gears can result in more drivetrain wear and tear. Maximum assist-speed is the speed at which the motor stops helping you pedal. We found it can be a rough transition from motor-assisted pedalling to human-power only. European bikes can only assist up to 25km/h. The higher assist-speed of 32km/h on some e-bikes made a difference – our testers found 25 to 30km/h was the sweet spot for speed vs comfort. If you have a long, flat commute, it could pay to choose a bike that assists you to 40km/h or more. There are 2 parts to the drive system interface: the display screen and the controller. Each drive system has its own configuration. Display screens mounted in the centre of the bars are the easiest to use. We preferred uncluttered displays showing easy-to-read essentials: speed, assist level and battery remaining. All displays also showed trip and total distance travelled. Some systems showed more: predicted range, instantaneous motor power, maximum and average speed, and elapsed riding time. While this extra information was nice to have, some of it seemed unnecessary and resulted in displays too busy with detail. The controller allows you to select assistance level, operate lights and use the bike computer functions. The best controllers used thumb buttons near the grip that could be found without looking, clearly differentiated the assist (+/-) buttons from any others, and gave tactile feedback. An e-bike battery is usually mounted inside the main frame on the “down tube” or on a rear rack, underneath the loading platform. 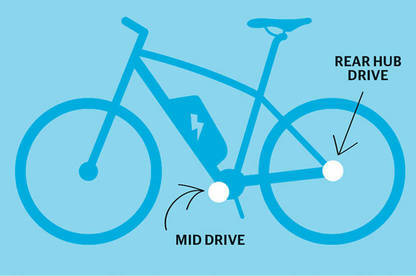 Batteries are heavy, so, ideally, they are mounted low (this helps create a stable bike that’s easy to handle). Some step-through bikes have batteries mounted in the rear rack. This can make the bike feel “rear-heavy” and raises the rack platform higher than usual, making it less stable when loaded. All batteries we tested are lithium-ion with at least 418Wh capacity, good for 30km of maximum assistance (even when thrashing them on our 20km hill-test circuit). If you want to ride further, look for a bike with a higher capacity battery, or be prepared to accept lower pedal-assistance in return for extended range. Time to recharge the battery depends on the power of the charger. We found most pumped out 180W, recharging the battery from about 30% to full in under 3 hours. The SmartMotion and Lekkie chargers, however, put just half that wattage out, taking twice as long to recharge the battery. We were impressed with the weatherproofing of the systems, suffering no glitches or failures in our winter testing, which included riding in some atrocious weather. But durability of batteries is worth consideration. All Li-ion batteries degrade with time, use and recharging – gradually losing capacity. Bosch says its batteries will retain 60-70 percent capacity after 500 full charge cycles – that’s at least 12,500km on maximum pedal-assist, or more than two years of 24km per day commuting, 5 days a week. A suspension fork adds safety and comfort. Unless you plan to ride off-road a lot, it doesn’t need more than 40mm of travel. It should be smooth and quiet when it moves. Test it by standing astride the bike and pressing down hard on the bars, then releasing quickly. Make sure the fork moves down smoothly under your weight and doesn’t make a “clunk” when it pops back up again. Look for hydraulic disc brakes. Not only are they smooth and powerful to use, they work as well in the wet as they do in the dry and are very low-maintenance. Cable disc brakes can be as powerful and smooth but need more maintenance, while rim brakes don’t perform as well in the wet. For comfort, safety and versatility, large-volume tyres with good tread are essential. Some have reflective strips in the sidewalls. A puncture-resistant lining is a good addition, as there’s no such thing as a convenient puncture. Mudguards protect you and your clothes from grime thrown up by tyres on wet roads in less-than-perfect weather. Look for full-length mudguards that wrap around the side of the tyre. A chain guard is useful if you ride in long trousers or skirt. A rear rack provides a platform for attaching a bag so you don’t have to carry a load on your back. Look for a wide platform to provide support to your load – some we tested were narrow. Some have a spring-clip to hold small items. A kickstand makes parking and loading the bike easy. Look for one mounted near the rear hub, as kickstands mounted centrally can hit the cranks and pedals when pushing the bike and aren’t as stable with a heavy rear load. The battery can be used to power fixed front and rear lights. This means you won’t get caught out at dusk or dawn, and modern LED lights use so little power you can use them as daytime lights without affecting pedal-assistance range. Being bolted to the bike makes them secure from theft and always there when you need them. Bike saddles are a personal thing – no one size really fits all. You’ll generally find wider, softer saddles on more upright bikes and narrower, harder ones on racier models. Wider, softer saddles are more comfortable for short trips, while narrower, harder saddles are better for long rides. The only way to see if a saddle is right for you is to ride the bike. Find a local bike store that sells different e-bike brands and styles. A store that knows e-bikes will help you find a bike style and a motor system that suit you. Talk to a few stores selling different brands. Test ride as many bikes as you can, trying different styles with different motor systems – and not just around the car park. Take them on a ride of a few kilometres at least, typical of how you’d use your e-bike. Try them up and down hills, at speed on the flat, and around traffic and on shared paths. Some stores will rent you an e-bike for a day, refunding the rental cost if you choose to buy a bike from them. Ask the store about maintenance and servicing. All bike shops can service a bike, but what about the motor? Ask how often the motor needs servicing, if they need to hook it up to a computer to analyse it, and if they service it in-store or need to send it away. Also ask if they offer a free bike check-up and tune after a few months to adjust brakes and gears. Before you hit the streets, you’ll need a few other items to go with your e-bike. And, no – one of them isn’t Lycra! At the minimum, you’ll need a helmet to ride legally on public roads and cycle paths and a good bike lock to protect your ride. Talk to the bike store when you buy your e-bike, as it should be able to offer a good package discount on accessories. You might also want to consider insurance. Adding an e-bike on to a home contents policy is the most cost-effective option. You need to specify the bike as an extra on the policy and maintain proof of value, but insurance shouldn’t cost more than a few percent of the bike cost. Check your policy covers your bike when locked in a public place, not just when stored at home, and includes third-party cover when riding. Get used to your e-bike before heading out on the road. It’ll be heavier than a regular bike, which means it handles differently. Start somewhere with a bit of space and have a go at adjusting the power settings, testing how the bike responds when stopping and starting, and turning, balancing and negotiating obstacles with different levels of power assist. On an e-bike you’ll probably be travelling faster than a regular bike. Other road users might not anticipate your speed. Ensure you scan well ahead, signal your movements and look out for cars turning in and out of driveways and side roads. In slower city traffic, be prepared to “claim the lane” as you may be moving as fast as other traffic. When starting off at an intersection or up-hill, use a low gear. You need to start pedalling before assistance kicks in, so be prepared for the surge in power and acceleration. Drivers might not expect you to start off so quickly – position yourself prominently on the road and use advanced stop boxes to get a head start on other traffic. You might find yourself passing other cyclists on busy routes. Make sure you pass safely: look behind you for traffic, signal before pulling out and give the other cyclist sufficient space. Shared paths are for slower more relaxed travel. Put your e-bike in a low power setting and cycle at a speed consistent with other users so it doesn’t put them at risk or make them feel uncomfortable when you pass. 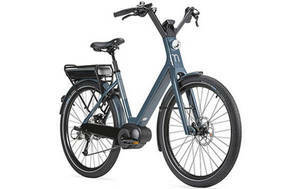 An alternative to finding an e-bike in the style you want is to take a normal bike you like and attach a motor system to it. You potentially end up with the exact bike you want, with all the benefit of motor assistance. We tested the Lekkie Summit kit, comprising a 300W mid-drive motor, 468Wh battery, controller and display, on a Linus Dutchi bike. It wasn’t really a fair test, as the Dutchi was a basic, step-through city bike with three gears, a big, curly handlebar and cable-operated rim brakes. That showed in its lowly 4.1 out of 10 “bike style” score. 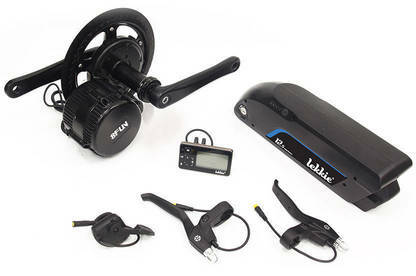 However, the Lekkie motor kit did better: its score of 6.6 was better than the SmartMotion and on a par with the Impulse mid-drive systems. It performed well climbing hills, despite the terrible riding position of the Linus bike, and unlimited assist and a hand throttle made riding at speed as easy as it gets (not that riding the Linus fast was anything other than a white-knuckle experience). We thought it would work particularly well on a bike set up for longer commutes. There were problems though. The large display could be clearer to read and controller buttons on the display panel meant it had to be mounted by the handlebar grip to allow easy operation – which could be awkward or impossible on some bikes. We had some problems with the torque sensor intermittently “missing” so the motor didn’t kick in when we started pedalling or didn’t give maximum assist when we were working hard. That could be down to a misalignment during installation of the kit, or a glitch in our particular bike, but it’s something to watch out for. Electricity cost for an e-bike: $0.06 per day (40km per charge from a 400Wh battery, with electricity at 26¢/kWh). Petrol cost for a small car: $1.80 per day (at an admirable 5L per 100km, with petrol at current prices). Bus fare: $7.26 per day (for a three-zone trip, using Snapper payment). 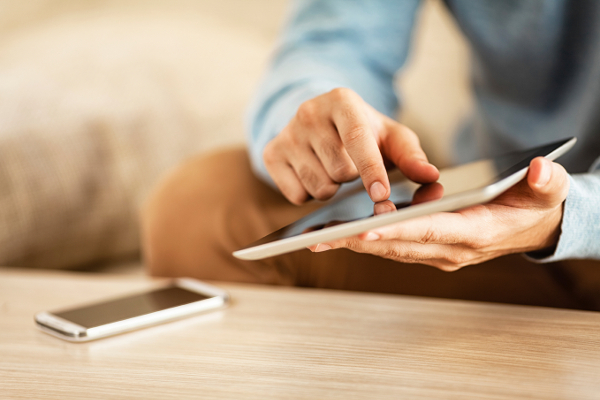 You need to factor in battery replacement into running cost calculations – rechargeable batteries don’t last forever. However, an e-bike battery should last for 500 to 1000 charge cycles (or 20000 to 40000km of riding) before losing capacity. That’s likely to be 4 to 6 years. Once capacity reduces, the battery is still usable but the bike’s range reduces. A top- end Bosch battery costs US$900 ($1400), while a Lekkie battery, using good quality Samsung cells, can be bought for half that price. Just like a normal bike, an e-bike needs servicing and new parts over its life such as tyres, a chain, and brake pads. An annual service at a bike shop, including parts, should cost no more than $200. Being classed as a “power-assisted cycle” means your e-bike won’t need an WOF or attract any registration costs. David Humm converted to an e-bike six months ago, using a Lekkie kit fitted to a Specialized hybrid bike. David works in Wellington’s CBD and lives in a hilly suburb – his house is 200m higher than his office. The e-bike has transformed his 12km daily round-trip, “Getting to work is no different to my old unpowered bike – it’s all downhill. On the return journey, I still pedal hard and get a good workout on the bike, but instead of a 30-minute uphill slog, my ride takes just 15 minutes. It doesn’t sound like much, but it means I get to see more of my family and I have energy left at the end of the day,” he said. Consumer staff spent two days riding the Lundi 26 on Wellington’s streets, shared paths and cycleways. Our regulations treat e-bikes (or “power-assisted cycles”) the same as normal, unpowered bicycles. This means they can be ridden by anyone with just a bicycle helmet, there is no requirement for registration or licence. To be defined as a “power-assisted cycle”, the bike has to be primarily propelled by a rider’s muscles and the motor must be electric with power less than 300W. If these conditions aren’t met, the bike is a moped, which means it must be taxed and registered and the rider must be licensed. Power is measured in Watts – it is the rate of energy conversion. For a cyclist that’s potential energy from food being converted into kinetic energy of motion (and a bit of heat). For the motor, the potential energy is stored in the battery, and the motor converts it to kinetic energy and heat. Power can also be viewed as a force multiplied by speed. On a bike, your power output is how hard you can push on the pedals (force) multiplied by how fast you are turning the pedals (speed). So how does an e-bike motor with a continuous output of 300W compare to the power needed to move a bike and rider? If you and your bike weighed 85kg, moving at a constant 20km/h on level ground with no wind, you would use approximately 105W. With a light 10km/h headwind or a gently graded 1 percent hill, power required to maintain that speed increases to approximately 160W. If you were a physically able but untrained cyclist, you could sustain an output of about 200W for 5 minutes. That’s at maximum effort and working up a real sweat. If you eased off the pedals, you could maintain more like 100W over an hour. That’s about the same as the power needed to move at a constant 20km/h on level ground with no wind. Riding into a stronger headwind, climbing bigger hills, or carrying a load, would mean you’d need to slow down. Or get fitter. If the headwind was too strong, or the hills too steep, you’d be off and pushing your bike. The extra power-assistance from the e-bike motor can make a big difference. At one extreme, with up to 300W available, your journey would be much easier. Alternatively, if you wanted to get the same level of physical workout, you could lower the power-assistance, but you’d still travel further and faster than on a standard bicycle. To place those power outputs in context, here’s a video of track cyclist Robert Förtstemann and his 74cm circumference thighs powering a 700W toaster for one minute.